This recipe is seriously sooooo good and is rich in iron. Just kidding. Did you think we were only gonna talk chow around these parts? Well, we’re here to play house, too. This is a clever little trick that I found from a blog that I can’t, for the life of me, remember. If and when I do, I’ll be sure and credit it. 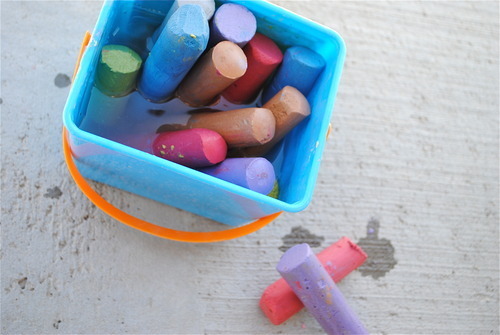 Simply take your pail filled with sidewalk chalk and fill it with water. Now doodle away. The chalks texture is really creamy- making it fun to draw with. You feel like you are doodling with big pastels. I also love that the colors are enhanced from the water. It’s a lot of fun sitting on the concrete with my toddler and drawing whatever we imagine. It makes me feel like a kid again.